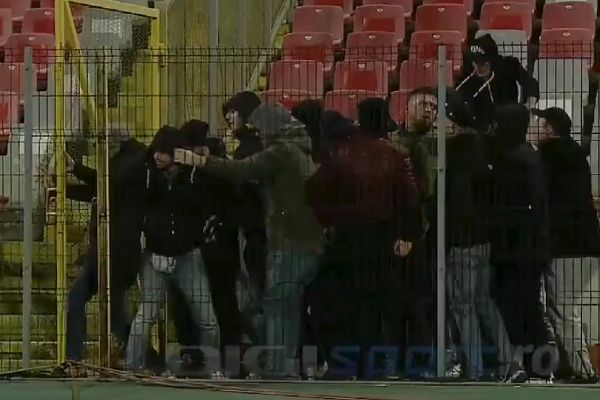 These angry Dinamo Bucharest hooligans tried to push down a gate besides the pitch at the Stadionul Dinamo, before they finally realised it wasn’t locked and they needed to pull the door instead. Furious following a 4-0 defeat at home to Viitorul in Liga I on Monday evening, a gang of the Romanian side’s supporters stayed behind. But they became jammed together behind a yellow, metal gate that seemingly needed to be bashed down. However a schoolboy error had been made and eventually the group managed to open the door by pulling it, before rushing through and clashing with police.